When the Philadelphia Eagles lost Carson Wentz for the remainder of the season in Week 14, they had an opportunity to look around for quarterbacks to potentially add to the roster, in case they had any questions at all about backup Nick Foles or No. 3 quarterback Nate Sudfeld. Instead, they decided to just roll with Foles and Sudfeld the rest of the way, even though they would have had a solid five weeks between Wentz's injury and their first playoff game to get another quarterback up to speed if they quickly signed one. Sure, Sudfeld was on the team in favor of whatever other quarterbacks were on the street, but as a young, developmental No. 3 quarterback. When Wentz went down, Foles became the starter, obviously, and Sudfeld became the No. 2. #Analysis. Still, there's a big difference between being the No. 2 and the No. 3. "We were confident in Nick, and confident in Nate as well," said former quarterbacks coach John DeFilippo during the week of the Super Bowl. "Nate's done a great job of maturing both physically and mentally as the year went on, so we were great with those two guys going the rest of the way." That confidence in Sudfeld has carried over into the offseason. On Wednesday at the NFL Combine, Howie Roseman was asked if Sudfeld could be a quality No. 2 quarterback if the Eagles decided to trade Foles. After carefully disclaiming that his comments had nothing to do with Foles or Wentz, Roseman heaped praise on Sudfeld. "Nate Sudfeld has a tremendous skill-set," he said. "Not only to potentially be a No. 2 in this league, but we also think he has upside to develop into a starter. I mean, (he’s) incredibly smart, athletic, good frame, can make all the throws. All you have to do is ask some of our defensive players on the scout team about him. We’re excited about him. We’re even more excited with (him) having a full offseason with our coaching staff in our offseason program and then a full training camp." Sudfeld's first ever professional appearance in a regular season game happened Week 17, in a meaningless game against the Dallas Cowboys, in which the Eagles' JV team lost to the Cowboys' varsity, 6-0. While Sudfeld and the Eagles' offense didn't put any points on the board, Sudfeld showed some encouraging signs. • On the day, Sudfeld was 19 of 23 (82.6%) for 134 yards (5.8 YPA), 0 TD, 0 INT, and a QB rating of 90.9. As you can see in the video, they were mostly short throws, which you might expect on a really cold day in Philly in late December. Batted pass at the line of scrimmage. Uncalled pass interference on a Cowboys DB vs. Brent Celek. Throwaway (that didn't count, as there was a penalty on the play). Poor throw (and decision) on 4th down to Shelton Gibson. In other words, there was only one clearly off-target throw by Sudfeld on the day. His accuracy was good. • At the 0:25 mark, Sudfeld makes a great throw to the sideline on 3rd and 13. It didn't count because Halapoulivaati Vaitai was called for holding, but Sudfeld showed off quality arm strength. • At the 1:40 mark, Sudfeld displayed much better mobility than I was expecting. He legitimately deked the crap out of Sean Lee, who as you all know is the best football player in NFL history. • At the 1:59 mark, on 3rd and 15, I want Sudfeld pushing the ball down the field there, at least to an area of the field where you might get into field goal range. A checkdown is worthless in that situation. Because he was added to the roster after 53-man cutdowns, we didn't get to see Sudfeld compete in practice this year, as our access to that is limited to training camp. As such, the above video is all there is of him in an Eagles uniform. It is a very small sample size. Still, Sudfeld's accuracy was good, his arm strength looked worthy, there were no obvious issues with mechanics, and he was much more mobile than anticipated. 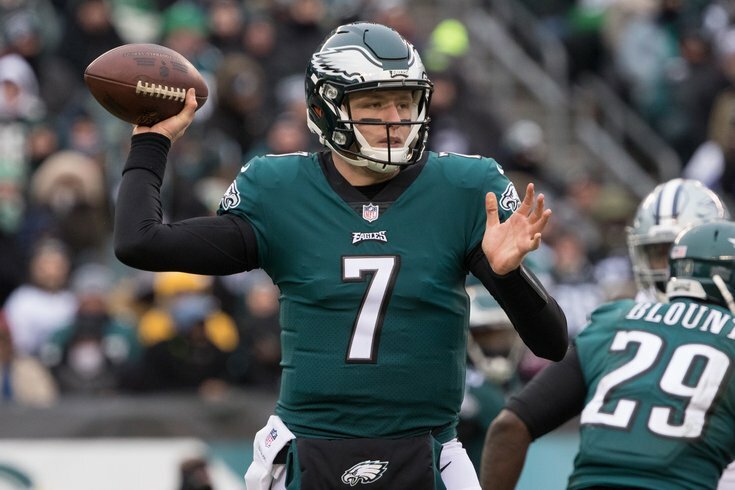 Should the Eagles trust Sudfeld enough to be the No. 2 in Philly next year if they trade Foles? I believe that he is talented enough to win games with the Eagles' excellent supporting cast around him in the event Wentz does not return in time for Week 1.